JUST AFTER MIDNIGHT last night, Drew Harris was attested as Garda Commissioner at the new Kevin Street Divisional Headquarters in Dublin. That was a private occasion, but now all eyes will be on the new head of An Garda Síochána – an organisation that has gone through scandal after scandal in recent years and is attempting to reform and modernise itself with limited resources. His appointment was broadly welcomed by his new colleagues, with the Garda Representative Association (GRA) commenting today that his experience as a police officer in the PSNI will have given him a better understanding of policing issues as they present themselves across the country. However the association’s director of communications John O’Keeffe was also quick today to remind the new commissioner exactly what those issues are – and to pile the pressure on. “The issues that need to be addressed by the new Commissioner are, of course, well known following Report after Report in recent years. From IT systems, recruitment, supervision, equipment and training down to the current garda uniform which is not fit for purpose, all stakeholders, are fully aware of what needs to be done. Mr Harris can however have a few quick “wins” under his belt he if wishes in his first year in office. If he can speed the process up for a new uniform for the frontline that encapsulates not just look, but safety and comfort for our members, this will be hugely appreciated by frontline gardaí. Couple this with a roll out of both body cameras and Tasers, as well as occupational supports for our members’ mental well-being and our new Commissioner will have achieved more in his first year, than many of his predecessors have in their full term. Speaking last night, after being sworn in at Kevin Street in Dublin, Harris said he was “very honoured and privileged” to become garda commissioner. He said a particular priority was doing “all we can to protect the vulnerable”. “We need to move quickly to adapt to a changing society to ensure that we are strongly positioned to protect the State, communities and the vulnerable,” he said. He said An Garda Síochána would deliver the “highest possible” operational and ethical standards under his leadership. We will have a workplace of openness and transparency, of equality of opportunity, and of management at all levels speaking with and listening to the people they work with. We will be more open to concerns raised internally and externally. Harris said he wanted An Garda Síochána to be responsible, accountable and fit for purpose, and added that it is now his “team”. Although his rank-and-file members are backing him – for the moment – there has already been strong opposition from outside An Garda Síochána before his attestation. In July, Donegal County Council passed a motion calling on the Minister for Justice to cancel Harris’ appointment. Council members who voted in favour of the motion said this was because of his previous links to British Intelligence services and his role in shutting down an independent probe which was investigating a gang blamed for more than 100 killings in the 70s and 80s. The motion cited a Belfast High Court judgement by Mr Justice Seamus Treacy which found that the PSNI’s decision to shut down the Historic Enquiries Team (HET) investigation into the activities of the loyalist gang was inconsistent with the police force’s human rights obligations. The gang, which operated mostly in Armagh and Tyrone, has been blamed for more than 100 killings during the 1970s and 1980s. Drew Harris was in charge of legacy investigations in the PSNI when the probe was halted. Earlier this month a High Court judge also dismissed an action aimed at blocking the former PSNI deputy chief constable from becoming the next Garda Commissioner. The action had been launched by Belfast-based researcher Ciaran MacAirt, whose grandmother Kathleen Irvine was one of 15 people killed when a loyalist bomb exploded at McGurk’s Bar in Belfast in December 1971. MacAirt had sought various orders including a declaration that due to his obligations under the UK’s Offical Secrets Act and his role in the protection of the PSNI, the RUC and other agencies of the UK Harris would be incapable of controlling an independent investigation into the murder of Irish citizens where collusion between loyalist terror gangs and British security forces was alleged. Gerard Humphreys Bl for MacAirt argued Harris lacked the independence required to be Garda Commissioner due to this role in the PSNI and its predecessor the RUC. The judge said he had considerable sympathy for MacAirt whose family were among the many victims of the Troubles. However, the judge said the action was “fundamentally flawed” and could not proceed because it did not seek to challenge, and had ignored the statutory process used to identify and select candidates for the position of Garda Commissioner. Chairperson of the Policing Authority Josephine Feehily hit back at the suggestion that the appointment of Harris created a conflict of interest. Speaking about his appointment on Morning Ireland, she said: ”I wonder is there a conflict that’s any different from the duty of confidence, in law, that other professionals have to a client. 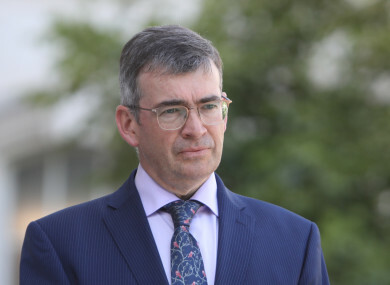 It is not clear whether Harris will address any of these concerns raised, either by the council in Donegal or in the recent court action, when he speaks to the media for the first time as Garda Commissioner tomorrow. But his frontline members are advising him to win the public’s trust by showing leadership and a clear direction for the organisation. “The organisation of An Garda Síochána is a large ship that now needs to be turned,” the GRA’s John O’Keeffe said. “Government must therefore provide Mr Harris and his team with the full financial support to ensure that these critical changes outlined are made without delay. With reporting from Sean Murray and Stephen McDermott. Email “'It's now my team': Drew Harris sworn in as garda commissioner”. Feedback on “'It's now my team': Drew Harris sworn in as garda commissioner”.